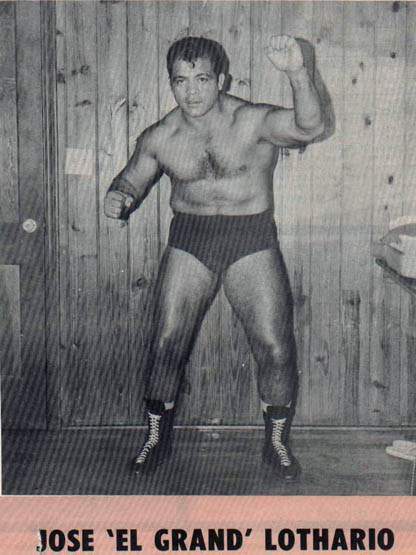 July 1967: Jose Lothario & Wahoo McDaniel defeated Sputnik & Rocket Monroe to win the NWA (Florida) Tag Team titles..
November 4, 1968: Jose Lothario defeated Boris Malenko to win the Florida Brass Knucks title..
June 13, 1969: Jose Lothario defeated Johnny Valentine to win the Texas Brass Knucks title..
April 20, 1970: Jose Lothario & Argintine Apollo beat The Missouri Mauler & Dale Lewis to win the NWA Florida Tag Team titles..
May 2, 1970: Jose Lothario defeated The Missouri Mauler (Larry Hamilton) to win the Florida Brass Knucks title..
August 22, 1970: Jose Lothario defeated Thunderbolt Patterson to win The Florida Brass Knucks title..
December 20, 1970: Jose Lothario & Danny Miller beat The Infernos and Boris Malenko & Great Mephisto in a 3-WAY..
~~~This unique three-way tag team match was for the NWA Florida Tag Team titles and took place in in St. Petersburg..
February 9, 1970: Jose Lothario & Ivan Putski beat Brute Bernard & Missouri Mauler to win the American Tag titles in Houston..
October 25, 1972: Jose Lothario defeated Stan Stasiak for Texas State Heavyweight title in Houston..
December 14, 1984 – WCCW: Jose Lothario defeated Tony Falk. December 16, 1984 – WCCW: Jose Lothario defeated John Tatum. January 25, 1985 – WCCW: The Midnight Express (Bobby Eaton & Dennis Condrey) defeated Johnny Mantell & Jose Lothario. January 28, 1985 – WCCW: The One Man Gang defeated Jose Lothario. February 1, 1985 – WCCW: Bobby Eaton defeated Jose Lothario. February 15, 1985 – WCCW: Jose Lothario defeated Kelly Kiniski. February 16, 22, 1985 – WCCW: Jose Lothario defeated El Gran Diablo. February 26, 1985 – WCCW: Jose Lothario defeated Nick Kiniski. March 4, 1985 – WCCW: Rip Oliver defeated Jose Lothario. March 29, 1985 – WCCW: Kelly Kiniski defeated Jose Lothario. June 22, 1985 – TAW: Big Bubba & Jose Lothario defeated Al Madril & Chavo Guerrero by disqualification. Madril & Guerrero retains the tag team titles. July 14, 1985 – TAW: Jose Lothario, Nick Kiniski & Paul Diamond defeated Al Madril, Black Gordman & Chavo Guerrero in a tag team elimination match. July 20, 1985 – TAW: Big Bubba, Jose Lothario & Shawn Michaels defeated Al Madril, Black Gordman & Chavo Guerrero in a tag team elimination match. July 28, 1985 – TAW: Big Bubba & Jose Lothario defeated Black Gordman & The Hood by disqualification. 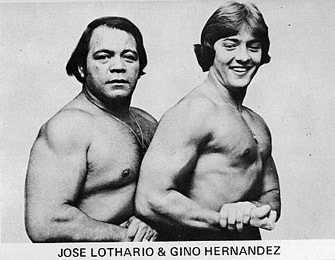 August 11, 1985 – TAW: Jose Lothario & Tom Jones defeated Gorilla Johnson & The Samoan. August 17, 1985 – TAW: Chavo Guerrero & Jose Lothario defeated Al Madril & Black Gordman. September 15, 1985 – TAW: Jose Lothario & Tom Jones defeated Gorilla Johnson & The Samoan. August 24, 1996 – Xperience: Jose Lothario defeated Jim Cornette. September 30, 1996 – RAW: Camp Cornette (Jim Cornette & Vader) defeated Jose Lothario & Shawn Michaels. Jose Lothario was one of Shawn Michaels trainers and made appearances in the WWF as his manager in 1997..
November 6, 2018: It has been reported that Jose Lothario has passed away at the age of 83.